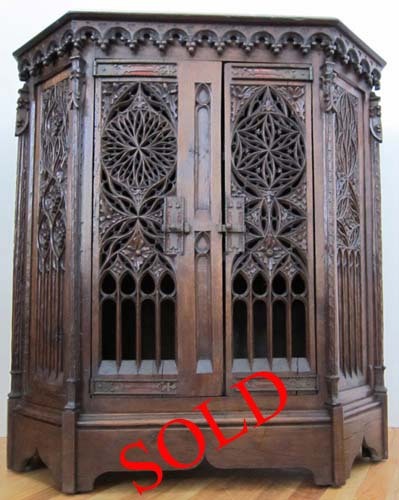 This small cabinet, made of oak in a simple six-sided design, is a masterpiece of flamboyant Gothic decoration displaying a rare combination of intricacy of design with open tracery or fenestrage. 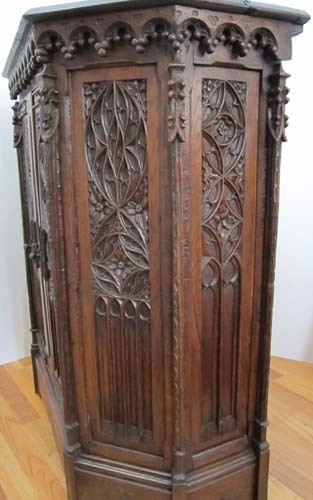 In our business, we see cabinets of all shapes and sizes but rarely one that evokes such appreciation for High Gothic architecture and its influence on 19th century craftsmen such as Camille ALBERT, to whom this piece is attributed. While exuberant in decoration, it is by no means overdone. 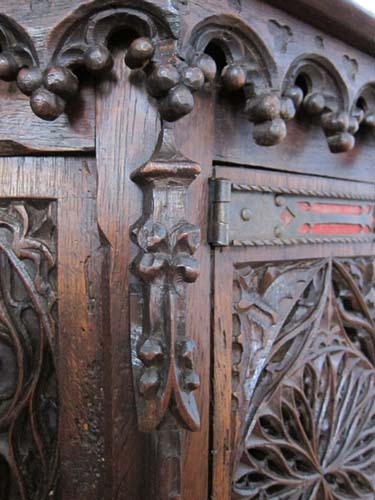 Similarly, the absence of linen-fold panels on the sides - nice decoration but often a cliché and a simpler way to fill space - are notable for their absence. 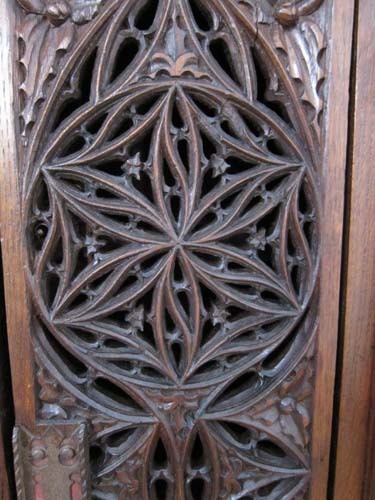 We cannot overemphasize how intricate and fine the carving is on this piece, taking the basics of the Gothic vocabulary of arches, rosettes, lancets, soufflets and quatrefoils to the nth degree of beauty and refinement. The front of the cabinet is comprised of two doors, each of which closes with its own latch. 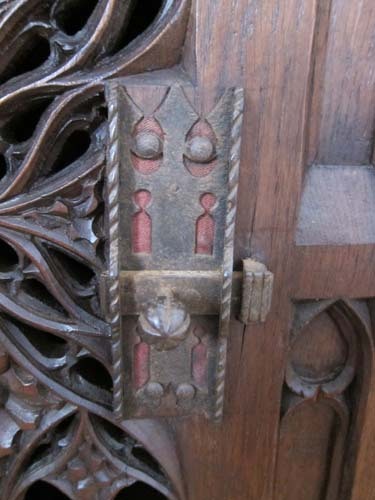 The left door is wider owing to the central lancets, which divide the front visually, being part of that door. Each door's design consists of a pointed arch divided into two sub-arches, which are each filled by two open lancet arches. 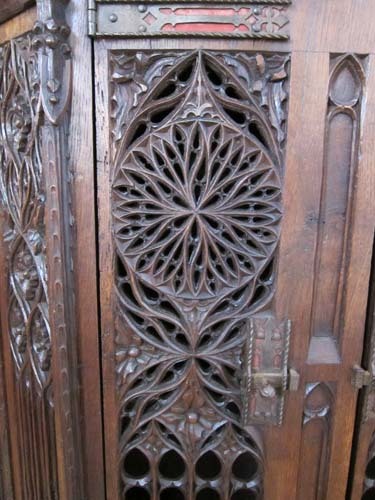 Above the main arch of each door panel is a large circular carving resembling a cathedral's rose window in intricacy of detail, again in an openwork treatment. In accordance with medieval tradition that no two things could be identical because only God was capable of such perfection, the two circular designs are quite distinct. 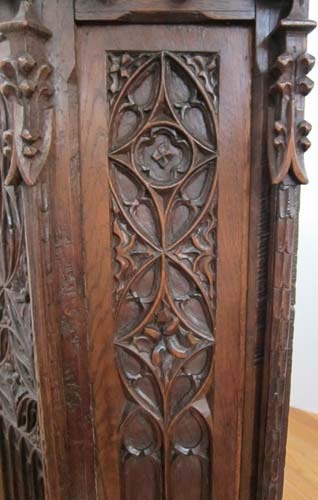 In their richness of detail, they represent the most intricate carving we have ever encountered on a piece of furniture. 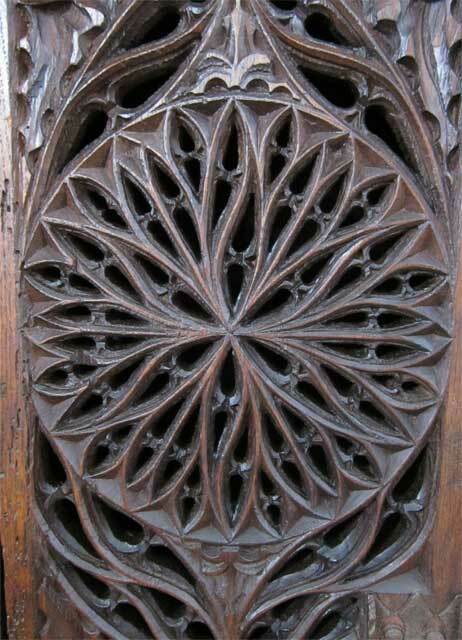 We cannot even begin to imagine what tools were used to accomplish it and how long it must have taken. Separating the front from the side panels and the side panels from one another, as well as from the back panel, are tall pilasters topped by finials. Below the top, and crowning each of the finials, is a frieze based on rounded, crocketed arches and clustered balls, possibly grapes. 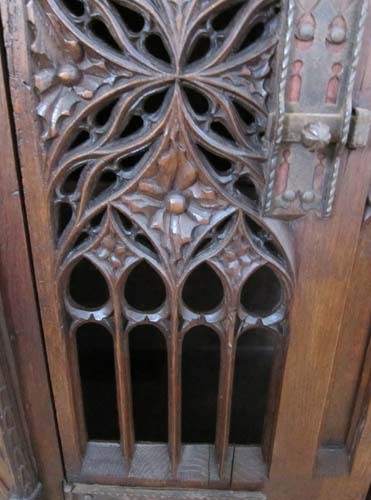 The side panels, both those perpendicular to the front and those at an angle, incorporate more tracery motifs of flowers inside soufflets and shapes reminiscent of the boteh found in Persian rugs, all punctuated with bits of vegetation or crockets, possibly stylized grape leaves. Again, each side panel is different from all the others. 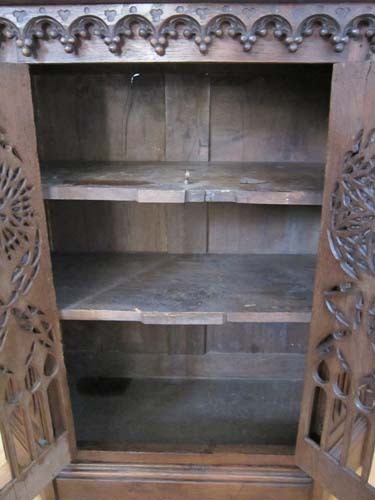 The top of this cabinet brings us to a mystery and possibly a unifying theme for this piece along with the table and chairs acquired with it - the wood. 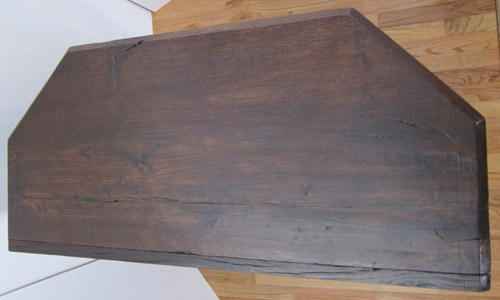 The top is characterized by dark, dense oak with splits and large knots in it. These are not defects of recent origin but rather part and parcel of the cabinet dating back to when it was made. 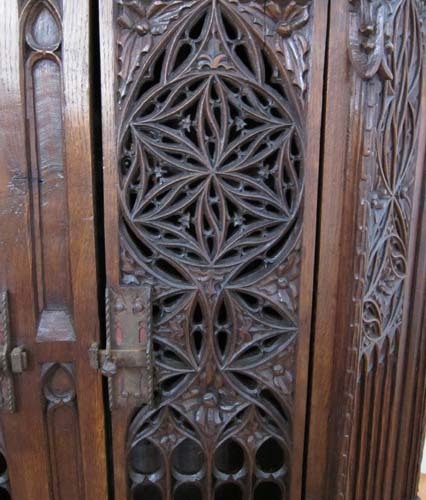 Why make such a magnificently carved cabinet out of wood with knots - something a furniture maker would discard or use for backs and drawers? The answer, we think, lies with a special tree. 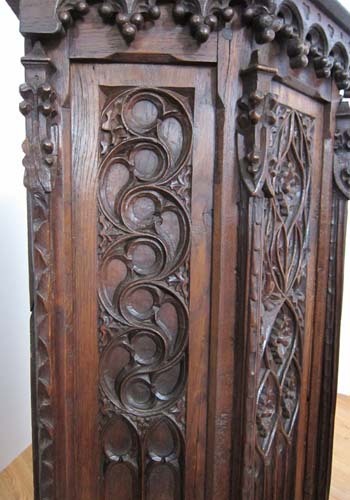 Given that we acquired all these pieces in a city in northern France, an area prone to cyclonic windstorms swooping off the Atlantic, our speculation is that the pieces were commissioned from a treasured oak tree felled in one of these massive blows and preserved by its owners, for all time, in this magnificent furniture. Ader-Tajan, Collection Bruno Perrier Haute Epoque (Catalog for Sale at Auction on April 6, 1992 at the Hôtel Drouot, Paris); Boccador, Jacqueline, Le Mobilier Français du Moyen Age à la Renaissance, Editions d'Art Monelle Hayot (Saint-Just-en-Chaussée, 1988); Thirion, Jacques, Le Mobilier du Moyen Age et de la Renaissance en France (Editions Faton, Dijon, 1998); Viollet-le-Duc, Eugène, Le Mobilier Médiéval (Georges Bernage, editor) (Editions Heimdal, 2003). Being rather narrow in depth, this cabinet is ideal for an entryway or foyer in a home or as a decorative item in an office. Copyright ©2019 M. Markley Antiques. All Rights reserved.